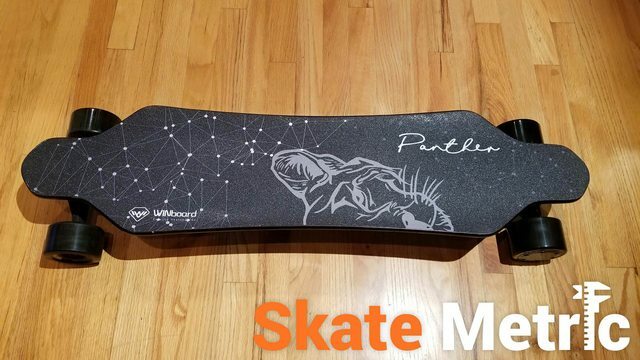 Home Reviews Winboard Panther Benchmarks and BRUTAL Review! Winboard has generated a fair amount of hype surrounding its new board, the Panther. Unlike most Chinese esk8s, this product retails for a more premium price of $750, which ostensibly buys you an impressive 28 MPH top speed, a massive 324 Wh battery, and a premium remote complete with telemetry. …Except it doesn’t, aside from the battery and slightly deceitful telemetry (RIP our relationship with the Winboard). One glance at the charts ought to illustrate the extent of the disparity between Winboard’s claims and the board’s actual performance. Not only is the board slower than advertised, it’s slower than every other (current generation) budget board we’ve tested. Furthermore, it uses the same Meepo-style ESC that we all know and hate for its jerky controls, removing any hope of redemption for this powertrain. The fancy new remote leaves much to be desired as well. The speedometer uses the wrong units (km/h!?) and tends to be a tad optimistic, and the thumb wheel (which feels incredibly cheap) began sticking after about 20 minutes of use. The screen is a nice addition, and some of the indicators are moderately useful, but we much prefer the vanila Meepo-style remote to this fancy new one. Basically, we just cannot see a reason to buy this product. A Verreal/Ownboard/WowGo with a Sanyo battery would provide smoother control, more torque, a higher top speed, a more flexible deck, and similar range (and it’d save you over $100). Next articleFlatland3D ESK8 Full Comprehensive Glove Review!